EDIT: Here is a better, updated version of this recipe! Check it out! When I was traveling in the UK with my family, I noticed that in every convince store, instead of the usual fruit danishes, they had these sausage rolls in pastry instead. I missed those once we got back in the States, and I decided to make them myself. These ones are a very simple and easy recipe that can be easily augmented. Defrost the pastry dough according to the package instructions and preheat your oven to 350. Once the dough has been defrosted, roll it out so that the long side is the length of 2 sausage links, as pictured. 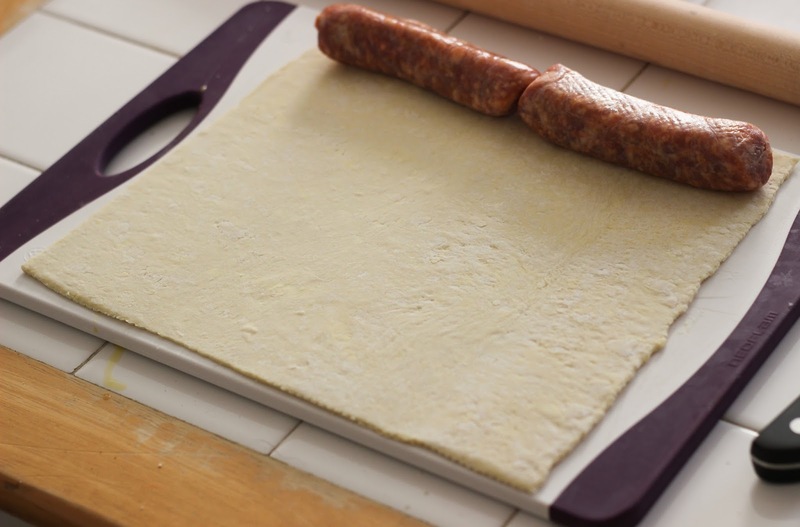 When the dough is the proper size, place your sausage links together at the top and gently roll them up. Right before the dough is about to overlap, brush a bit of the egg wash on the two pieces that are about to touch. Overlap the dough a little and then cut off that roll. Brush the top of that roll with some egg wash to enhance browning. Repeat with the remaining sausage links and sheets of pastry dough. if you get to the end of a sheet and find that you don't have quite enough to overlap, just roll the dough a bit or stretch it out by hand, yes that will make the pastry a bit thinner, but it will still work. Once your rolls have been assembled, cut them into 1 inch pieces and bake for 15-20 minutes or until the sausage is cooked through and the top is golden. Enjoy these warm with ketchup or mustard. 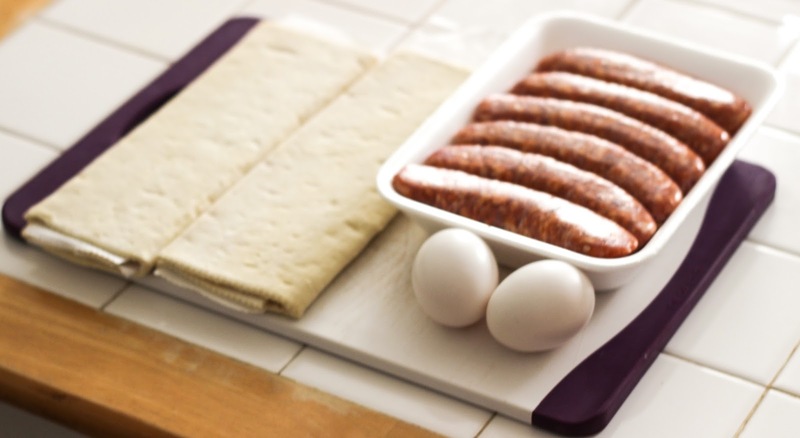 *When I make this I leave the sausage casings on because they don't bother me in the final product. 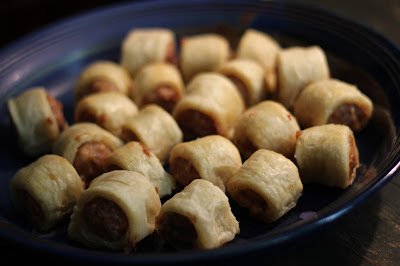 They do, however, bother my wife, and if they would bother you, feel free to strip them out of there casings or use a 1 lb package of sausage meat and roll it into thumb size strips.